Everyday activities such as using the computer, driving, or even curling up with a good book can create tension in the neck and shoulders. It’s no wonder that so many of us have persistent discomfort and pain in these areas. Healing Yoga for Neck and Shoulder Pain presents simple, yoga-based practices that you can do at work and at home to release muscle tension for immediate relief. 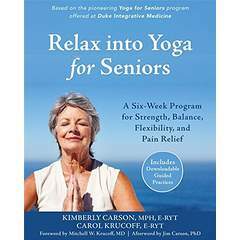 Carol Krucoff, E-RYT, is a yoga therapist at Duke Integrative Medicine in Durham, NC, where she creates individualized yoga practices for people with health challenges. She is also an award-winning journalist, who served as founding editor of the Washington Post’s Health Section. 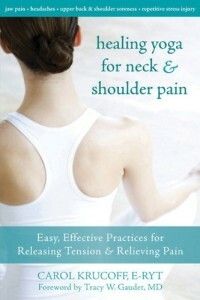 After suffering from chronic neck pain for years, Carol developed the unique self-care program found in this book. Now you, too, can free yourself from neck pain by practicing simple yoga exercises to stretch tight muscles and strengthen weak ones and by learning to properly align your body when performing everyday activities that may be contributing to your pain. This fully illustrated, easy to follow guidebook also addresses common problems that may accompany neck tension, including headaches, upper back pain, and stress. Foreword writer Tracy W. Gaudet, MD, is executive director of Duke Integrative Medicine and was the founding executive director of Dr. Andrew Weil’s Program in Integrative Medicine at the University of Arizona.